It’s that time of year again: it’s time to talk about the U.S. News and World Report’s 100 Best Jobs of 2018! We’ll be breaking down the list by industry, and discussing which jobs you can get with training from Dallas Community Colleges, and showing you the expected job growth and annual mean salaries for these jobs in Texas. For our purposes, a living wage is the absolute minimum amount an individual must earn per year, working full time, to support him- or herself and any dependents (if applicable). Obviously that’s going to vary based on how many adults are in the household, as well as how many children. Use the Living Wage calculator on our website to figure out what kind of wages you need to earn to meet your basic needs. Role: Most dental hygienists work in dental offices alongside dentists. They will usually see a patient first and clean the patient’s teeth, removing tartar, stains and plaque as they brush, floss and scrape. Role: Registered nurses monitor a patient’s condition, perform medical procedures and administer medicine. Role: Respiratory therapists specialize in helping to treat people who have breathing problems or diseases. Role: A diagnostic medical sonographer uses high-frequency sound waves to visualize the soft tissue structures of internal organs as requested by physicians to diagnose patients. Role: Radiation therapists work with CAT scans, X-rays and Cone beam computed tomography before radiation is even administered. Role: Medical assistants are usually the first people you see during a doctor’s appointment. They might cover the front desk, answering phones and filing forms, and they might also do hands-on tasks like drawing blood, administering injections and making sure medical histories are accurately recorded. Role: Medical secretaries manage the daily ebb and flow of patients through a doctor’s office. Medical records technicians might also be called coders, coding specialists or coding representatives. Medical and health services managers are the planners, directors and coordinators who work behind the scenes to keep hospitals, nursing homes, group practices and other health care facilities running efficiently. 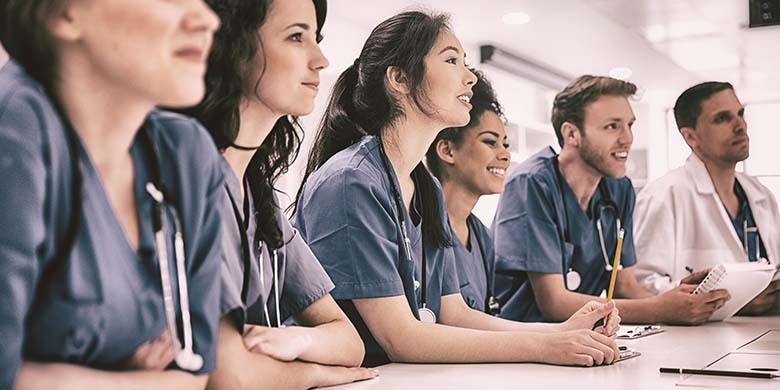 Educational Pathways: For larger health care systems and hospitals, most medical and health services managers have at least a bachelor’s degree — however, for a smaller private practice, the vast majority of managers have an associate degree or trade school certificate. Training in a Medical Front Office program and/or skills development in Electronic Health Records, Insurance Coding and Billingor a Medical Administrative Assistant/Secretary program will all help prepare you for these types of jobs. Graduates of these programs can expect to work with patient records, insurance billing, computerized accounting and patient databases and to transcribe dictated notes and apply standardized codes to patient records. Role: Occupational therapy assistants help people get back into the routine of living by working with patients on routine tasks, such as getting dressed or brushing your teeth. Role: Radiologic technologists perform medical imaging exams and administer radiation therapy treatments. Role: Home health aides assist patients with tasks they are unable to complete by themselves. That might mean anything from household chores to administering basic first aid care or assisting patients with bathing. Educational Pathway: Aides at agencies that receive funding from Medicare or Medicaid are required to get a minimum level of training and pass a competency evaluation or receive state certification, such as through a Home Health Care and Hospice Aide program. Role: Physical therapist aides support physical therapists and physical therapist assistants by cleaning and sanitizing treatment areas and equipment, washing linens and performing clerical tasks. Educational Pathway: Physical therapist aides are usually required to take annual competency exams, making a Physical Therapy Aide program invaluable to developing and maintaining skills. Role: MRI Technologists operate machines that use a magnetic field and radio waves to create images of patients’ organs, tissue and bones. Role: Before the surgeon scrubs in, surgical technologists sterilize the operating room and set tools out on the tables for procedures. Role: A clinical laboratory technician is responsible for things like examining bodily fluids and cells and matching blood for transfusions, and will likely use equipment like microscopes and cell counters. Role: Licensed practical and licensed vocational nurses check vital signs, perform enemas, install catheters, dress wounds, deliver medicine, massage muscles, assist patients in maintaining their hygiene, help with feeding (for infants to the elderly), start IVs, monitor medical equipment and so much more. Role: Dental assistants usually help with things like preparing and sterilizing instruments, processing X-rays and maintaining patient records. Learn more about our nursing and health care degrees and certificates. I have found the list very informative. Thanks for article!